Mahabharata story: Obedience key to success! Indra once offended his spiritual master Brhaspati. The demons were quite submissive to their spiritual master Sukracharaya and when there was battle between devas and demons, the demons were victorious, on account of their submission to their Guru Shukracarya. When the devas found that Shukracharya was using amrta sanjeevani mantra which was bringing the dead and injured demons back to life, Brhaspati summoned his son Kacha to go and learn the mantra from Shukracarya. Kacha wholeheartedly accepted his father’s instruction and kept it as his only goal. So Kacha went to other camp and offered respects to Shukracharya and told him to accept him as his disciple. Sukracharya knew that Kacha’s inner motive is to learn the amrta sanjeevani mantra. So he was determined not to teach that to him, but still allowed him to stay with him. In course of time, Shukracharya’s daughter, Devayani fell in love with Kacha and decided that she will marry him. The asuras did not like Kacha’s presence and so they decided to kill him. They chopped him into pieces and threw all the pieces in different directions. 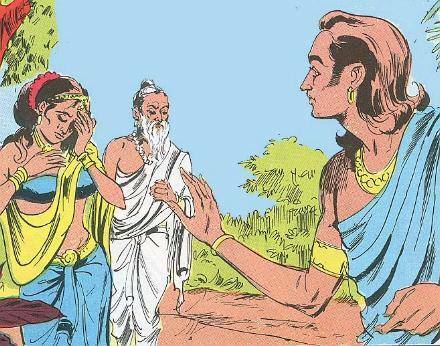 So to please his daughter, Shukracharya chanted the mantra and from nowhere Kacha appeared again. Kacha requested him to teach the mantra with which he brought him back. But Shukracharya refused to give it. Kacha waited patiently. The next time the demons took him to a faraway place to kill him. They ground his body in the grinding mortar into a nice paste and trew the paste into the ocean. Again Devayani cried and amrta sanjeevani was chanted and Kacha came back. Kacha requested Shukracharya for the mantra, but again he was denied. Kacha did not lose heart. He remembered the force and power of obedience – the potency of obedience. Next time the asuras wanted to make sure that the mantra is not used. So they killed Kacha, they chopped him up, they ground him, made him into a paste and then they took a glass of wine and they poured the powder into the wine and gave it to Sukracharya to drink. So in the evening, when Devayani asked for Kacha, Sukracharya realized that Kacha is in his stomach. But if he comes out, he will kill Shukracarya himself. Kacha spoke from within the stomach. Then Shukracharya had no choice and he had to teach the mantra. We can see Kacha has taken the instructions of his father to his heart with full surrender and so he was able to tolerate all the troubles. The result is complete success. Most of the time, we will take only those instructions which fit into our mind and intelligence and we will completely ignore those instructions which are not palatable to our mind, ego and intelligence. Arjuna surrendered with his heart to the instructions of the Lord and in the end came out successful in the battlefield of Kurukshetra. Let us try to meditate on the next characteristic of obedience. Surrender with your heart for instructions from superiors – (hrda atmana arpitam): Manu’s obedience was based on accepting the instructions without any reservations (nirvyalika) and beyond the limit of envy (gata matsaraih) and this has resulted in his surrender to Lord Brahma with full heart for the instructions.